CarGurus has 6,901 nationwide QX80 listings starting at $15,995. For drivers who enjoy tooling around in a traditional full-size luxury sport utility behemoth, Infiniti’s 2015 QX80 should fit the bill quite nicely. Once known variously as the QX56 and then simply the QX, this big 7- or 8-passenger sport ute has been relabeled a few times over the years. No matter its moniker, this well-regarded jumbo hauler again boasts a potent V8 powerplant, some hefty off-road capability, plenty of bells and whistles, and 95.1 cubic feet of cargo space with the second- and third-row seatbacks folded. Furthermore, this is an SUV that, with its towering ride height and no-nonsense profile, looks like an SUV. For the upcoming model year, the QX80 offers a pair of trims: the traditional Base, available with either standard rear-wheel drive (RWD) or available full-time all-wheel drive (AWD), and the new-for-2015 Limited trim, which is delivered only in the AWD configuration. Said AWD setup comes with a 2-speed transfer case, allowing some semi-serious off-road adventures and permitting a number of reviewers to describe it as a 4-wheel-drive (4WD) configuration. Meanwhile, a bunch of hefty tweaks have also been incorporated into the 2015 QX80, beginning with a refreshed grille, a larger rear bumper protector, LED running lights, and adaptive LED headlights. The upcoming model year adds Majestic White, Graphite Shadow, and Hermosa Blue as exterior color choices. Further improvements for the 2015 editions also include upsized alloy wheels, upgraded cabin accent materials (including burled wood trim) and an available front and rear collision-warning system. Big utes need big power, and the 2015 QX80 is no exception. Its standard 5.6-liter V8 engine returns to pound out 400 hp and 413 lb-ft of torque, all of it under the management of the standard 7-speed shiftable automatic transmission. AWD trims boast a driver-selectable Auto mode that allows cruising in RWD in normal conditions, with torque automatically diverted from the wheels that slip to the wheels that grip when roads get treacherous. When leaving the asphalt for the backwoods, the AWD system can be shifted from 4H to 4L to tackle some of the trickier portions of the trek. Once again, though, along with big power comes a big thirst for gas. Mileage in this plus-size sport ute returns at a wallet-whacking 14 mpg city/20 highway in both RWD and AWD variations. 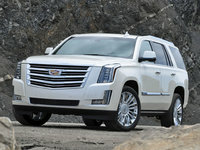 Towing capacity, meanwhile, remains maxed out at some 8,500 pounds using the standard Class IV tow hitch and wiring. Appearance-wise, the 2015 QX80 sports a power moonroof, 20-inch alloy wheels, a roof rack, step running boards, a power liftgate, skid plates, and heated reverse-tilt power-adjustable mirrors. Inside, look for leather-trimmed upholstery in all 3 rows of seats, along with heated power-adjustable front seats, second-row captain’s chairs and a heated steering wheel with power telescoping and tilting functions. Of course cruise control again comes standard, as do front and rear parking sensors, an around-view camera system, remote engine start, an auto-dimming rear-view mirror, and a remote garage door opener. Tri-zone auto climate control also remains standard, along with such techno-goodies as Bluetooth-integrated Infiniti Connect voice-activated infotainment with its 8.5-inch touchscreen and a hard-drive-based navigation system. Infiniti offers entertainment via a 13-speaker Bose premium stereo including a single-CD/DVD player, satellite radio, Bluetooth audio streaming, and an auxiliary audio input. To all this, the debuting Limited trim adds upgraded alloy, leather, and genuine wood cabin accents; upsized (22-inch) alloy wheels; and a new Truffle Brown leather and faux-suede interior look that also includes leather-trimmed speaker mesh. Rear-seat DVD entertainment also comes standard in the Limited trim while remaining an option for the Base version. Options for 2015 QX80 Base include, besides those newer add-ons mentioned earlier, rear-seat DVD entertainment, upgraded climate-control functions, roof-rail crossbars, and an upgraded Bose stereo sporting 15 Surround Sound speakers. Standard safety equipment aboard the 2015 QX80 includes 4-wheel antilock brakes (ABS), front side-mounted airbags, active front headrests, and 3-row head airbags. 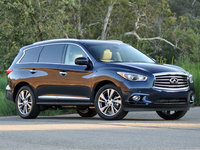 Standard front and rear collision-warning systems, LED running lights, and adaptive LED headlights are, as mentioned, new for 2015, while front fog/driving lights, a post-collision safety system, turn-signal-integrated mirrors, Infiniti Connect emergency telematics, and a remote antitheft alarm all return from 2014. Furthermore, the Base trim can be delivered with available adaptive cruise control, blind-spot warnings, and lane-keeping assistance technology, all of which come standard in the new Limited. 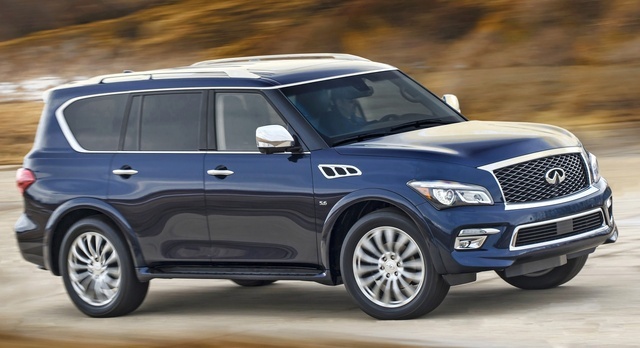 What's your take on the 2015 INFINITI QX80? Users ranked 2015 INFINITI QX80 against other cars which they drove/owned. Each ranking was based on 9 categories. Here is the summary of top rankings. 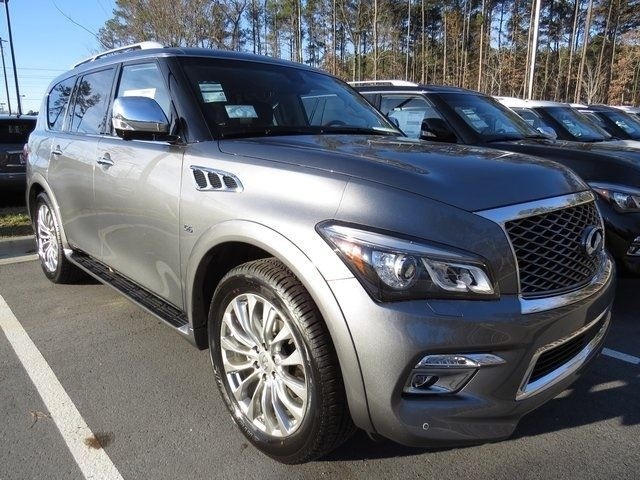 Have you driven a 2015 INFINITI QX80? My Car I just listed shows an accident reported. The dealer I purchased the car from shows a clean Car Fax? where is this accident report coming from?